Effective insect screening has long been a problem for home and business owners wanting the design freedom to link internal and external areas without the pests. All Aussie Aluminium and Glass makes it easy to choose aluminium bifold or multi-fold doors for your Perth home or business with the Hawkesbury Plus from ALSPEC. Hawkesbury Plus is the world’s first integrated screening system for aluminium bifold doors, ideal for Perth’s laid-back life-style. This is a smooth running, clever screening solution for multi-fold scale openings. Screen components are integrated into the architecture of the door with the whole unit functioning simply and reliably. 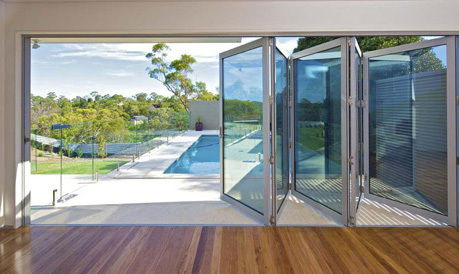 Hawkesbury Plus maximises the use of your aluminium bifold doors in Perth, whatever the season. 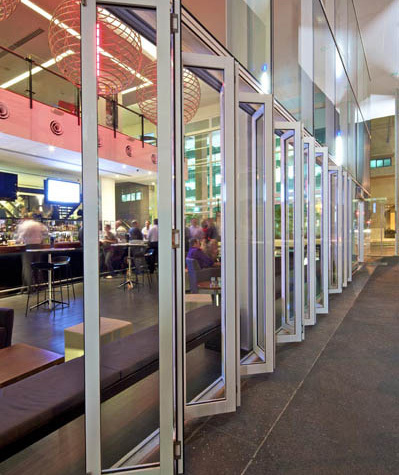 The entire range of Hawkesbury E2/E3 aluminium multi-fold and bifold doors for Perth are designed with large floor-to-ceiling applications in mind and combine full-sized commercial perimeter framing with specially designed commercial door stiles. The Hawkesbury range is top-rolling for smooth, trouble-free operation whether configured for inward or outward stacking or with an odd or even number of door stiles. Tyred floor guides run effortlessly in channels neatly concealed beneath closed doors, while weather-seal technology keeps wind, rain and cold air out. A stabilising centre hinge controls door stile deflection and bowing on tall doors, while the exclusive Surelock™ system allows for simple vertical height adjustment with a screwdriver. A functional alternative to traditional door units for light commercial and residential applications, make the Hawkesbury E2 or E3 from All Aussie Aluminium and Glass your first choice for aluminium bifold doors in Perth. Link indoor and outdoor spaces and keep the insects away without compromise on performance or aesthetics with our aluminium bifold doors for your Perth home or business. Call us today on (08) 9309 5880 to get a quote.